I am surprised how good the handwriting is. Those must be small children. Hi! I don't know about you, but I don't feel so safe... Can you visit my blog please? Married mom to two girls navigating the unexpected twists and turns of life in this impressive and sometimes daunting city. We're finishing up our ninth year of living here, and the city has changed so much during this time! I taught French and Spanish back in the USA and now I'm the Head of Foreign Languages in a Russian private school. We initially came here for my husband's job—but now he'll be transferring to London in September 2013. My job & volunteer position at the Sochi Olympics—and the girls' schooling—will keep us in Moscow for one more year until we join him there next summer. In their folk outfits from Izmailovo market, posing for our first Christmas card photo as expats. At this point they still spoke very little Russian. Showing off their new Russian dresses. 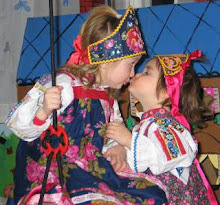 Katya needed hers for a recital at school, and Natalia didn't want to be left out! ...And now, nine years later! Hanging out with the enormous matryoshkas at the Moscow City mall. 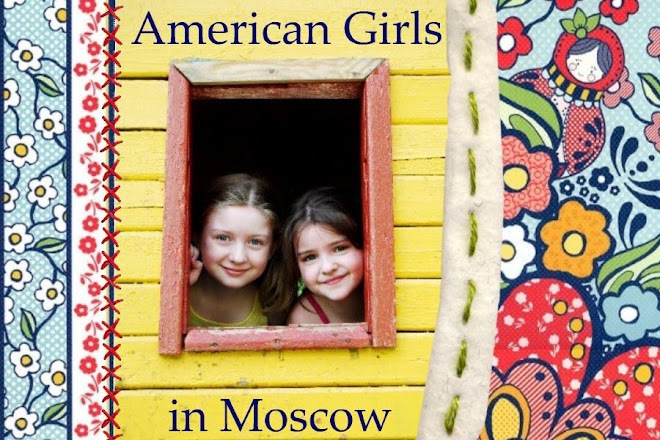 "American Girls in Moscow" Groupies: Thanks! Fun English Vocabulary Game for a Good Cause! Huh. Kind of Cool... Never Would Have Thought It! My blog is worth $9,597.18. I used this program to get me on my way to running a half marathon across frozen Lake Baikal!